The Exstreamer 1xx family of products decode IP Audio streams and play out the recieved Audio signal to amplifiers or speakers. Supporting a large number of protocols, encoding methods and application specific firmware, the products can be used for Broadcast, Internet Radio, as well as VoIP applications. Control and local storage interfaces are device specific to match different use cases. Designed in Switzerland and installed in tens of thousands of locations worldwide, the Barix Exstreamer series is the established standard for Instore Radio, Internet Radio, Entertainment and Broadcast applications alike. 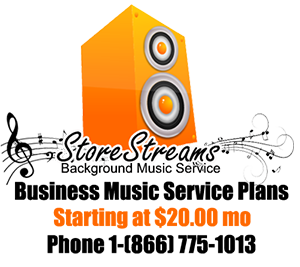 StoreStreams is the turnkey commercial background music service for your business. The Store Streams music service is a streaming media solution that integrates seamlessly within your business environment. StoreStreams offers music and messaging, web based delivery and complete commercial music systems for your business. With StoreStreams your business has access to the best in today’s hit music and a wide ranging music catalog to create the perfect vibe for your retail outlet!